recorded by jean marie gilles, june 08 at les gilles studio Berlin, Neukölln. produced by sternschuß, Berlin, 2008. 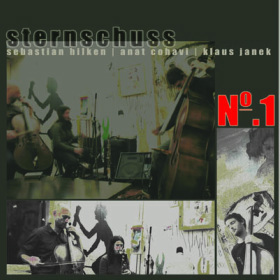 The Berlin-based SternSchuss trio presents its own bold version of free improvisation on its self-produced debut release, SternSchuss No. 1. The trio is comprised of Israeli reed player Anat Cohavi, whose resume includes studies with Israeli saxophonist Albert Beger and composer Slava Ganelin, in Texas and in North India, where she studied the shenai, a traditional wind instrument; German cellist Sebastian Hilken, who has collaborated with such diverse improvisers as Evan Parker, Elliot Sharp, Chris Cutler and DJ Olive; and bassist Klaus Janek, who has studied with seminal bass master Peter Kowald, released the solo bass album Caspar (FMP, 2004), and collaborated with left-of-field improvisers including Agusti Fernandez, Joe Maneri, Wolfgang Fuchs and Borah Bergman. The ten improvisations seek to find common language through a restless and intense search for changing timbral ambience and colors. Quite often, these improvisations stress the immediate contact with the wood of the cello and double-bass, and the typically dark sounds of the bass clarinet. At other times, the improvisations are enhanced by the use of found objects on the instruments, as well as various effects and electronics. Such close interplay demands a rich and unorthodox vocabulary on each of the trio members’ instruments, as in the use of bows by both Hilken and Janek as percussive additions, or the sustained vibrating sound of Cohavi’s reed instruments, which sometimes references Indian-tinged cyclical sonorities. And the trio’s ingrained ability to re-form, re-address and abstract the continuously flowing interplay with fresh ideas and gestures is something that can only be developed through long and tasking democratic collaboration. This band demonstrates here that it has already gained such a unique interplay. On some of the improvisations, beneath the jangled and disjointed interplay surprising early influences can be unearthed, such as swing jazz on “Part C.” On “Part E,” you can sense the enormous debt to the late Kowald’s inventive ways of attacking the double-bass, which also resonates with traditional string instruments. Other improvisations, such as “Part F” and “Part G,” begin with strange and abstract sounds that are patiently woven into a loose narrative. Improvisations “Part H” and “Part I” are of the busier kind, and emphasize the playful side of the trio.